Town of Salem started off as a free-to-play browser game developed by a team called BlankMedia Games based in Austin, Texas but the game eventually made its way to Steam, thanks to a Kickstarter project in 2014 that raised $114,197 from 7,506 backers. 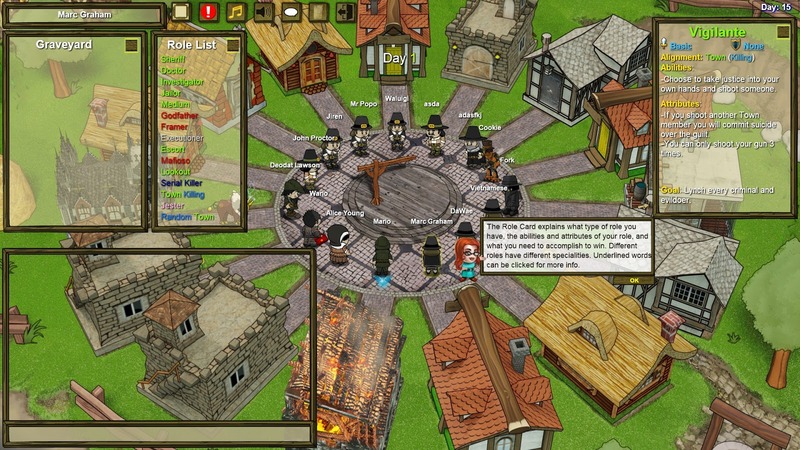 So, what exactly is Town of Salem all about? It's basically a new take on old party games such as "Mafia" and "Werewolf" where 7-15 players are randomly assigned as Town members (the good guys), the Mafia (the bad guys) or as solo roles that don't belong to a team (such as the Serial Killer, Jester or Executioner). The goal for the Town members is to determine who the bad guys are before they are killed by them but you will have to spend time gathering evidence and eventually trusting the right people in order to bring the Mafia and Serial Killer down. The base game has 33 roles to choose from (although some are only available in particular modes); 49 roles are available if you include The Coven expansion. Once players have been assigned their roles the game starts. The game is broken into two phases: a night phase and a day phase. During the night phase, most roles are able to use their abilities such as investigating people, killing people or healing people. During the day phase, players discuss who they suspect of being a bad guy and they can vote to put someone on trial. The accused are given a chance to convince the other players they are innocent before another round of voting decides whether they are guilty or innocent. If enough guilty votes are passed, they are lynched. If the Town members manage to lynch all the evil roles, they win. However, if the Mafia manage to eliminate all of the Town members, then they win. The Serial Killer wins by killing off everyone, and roles like the Jester and Executioner, have other goals, which result in much misdirection and mischief in the process. Town of Salem was actually a Christmas 2017 gift from Choona who, as we all know, is another contributor here at Choicest Games (in more ways than one I suppose, hyuk hyuk) so many thanks to Choona providing me a copy. I also happen to enjoy playing deduction party games such as The Resistance (which is a similar kind of game) so Town of Salem was a very good choice on Choona's part. The game has a lot of roles to pick from and the official web page gives you basic details on each of them. When I first started playing Town of Salem I thought that I'd probably have fun for a few hours and then eventually stop playing it (like a lot of games on my Pile of Shame): this wasn't the case. Despite the game being not much more than a chat client with a party game tacked onto it, it's actually quite addictive and I found myself coming back again and again to play it (which is why I've now clocked over 40 hours). It does help to play with friends though since it's funnier when you can share the experience. As mentioned, there are quite a few roles to play: 33 in the base game and 49 if you have The Coven expansion. Each role has its idiosyncrasies and it will take time before you realise what are the best ways to play for each of them. It keeps things fresh and favours players who often find themselves a jack-of-all-trades (like myself) instead of those who can only focus on excelling at one role and nothing else. The game still has a relatively active community and there are around 800-1,000 players online whenever I play the game during Western Australian evenings. This number may in fact be higher if it doesn't count the players who are playing via mobile phones. The game has a whopping 361 Steam achievements to unlock although it does not have any Trading Cards or Leaderboards (there is a ranked multiplayer mode though). There are so many aspects of the game that depend on the community that plays it. For example, since the game is a multiplayer-only game, you can only continue to play the game provided there are enough players playing it; since the game has no bots, there's no way of playing this single player (and it would be quite difficult to program a bot to come across as human in this game anyway). You also have to rely on the community not being a bunch of knobs when you're trying to learn the ropes and for every genuinely helpful player I've come across in this game, there's always another that's keen to type disparaging remarks about your stupid behaviour. Yes, there is a pretty good wiki out there and the game does give you hints when you play a role for the first time, but you're only going to really learn how to play this game through experience which means interacting with real people. 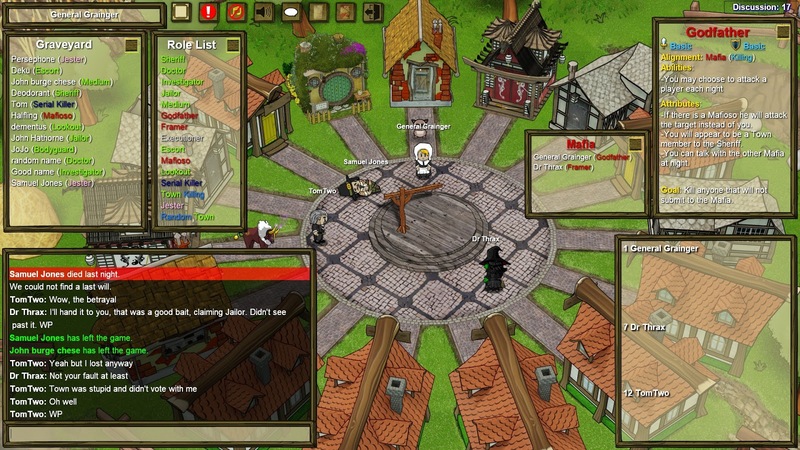 When people cheat or spoil the game in Town of Salem it's called "gamethrowing". For example, if you play as the mafia and then rat out your comrades when you get lynched, that's considered "gamethrowing"; also, if you are friends with someone in real life and collaborate with them using VOIP software like Skype, Discord, etc. this can also be considered gamethrowing since you already have insider information on which roles are left (as you already know which roles your friends are playing). The game does have a system which allows you to report people for this behaviour (and I've seen it being blatantly abused three times now) but I have no idea how effective the system is. There isn't much to do in this game besides talking to other players via a chat window and pressing a few buttons every so often in order to perform your role abilities. While this isn't really a problem for me or for anyone who likes party/board/card games, it could be for those wanting a bit more action and interactivity in their games. I did try and play The Coven expansion but it resulted in several minutes waiting for even the minimum 7 players to join, and we already accounted for three of the players in our party! So, unless you're playing at the peak time for the expansion or you already have 14 friends to play with, I don't think the expansion is worth it since it's difficult to find a game. I'm a person that values honesty so I find it very difficult to tolerate liars or lie myself – consequently I'm quite terrible at trying to hide my role if playing one of the evil or neutral roles in the game, unless I can convince myself it's all just part of roleplaying (which in truth, it is); doesn't make it easier though and for those who are like me, I suspect you'll find it challenging too (at least at first)! Town of Salem is nothing more than a glorified chat client to play a party game similar to "Mafia" or "Werewolf" and your enjoyment of the game really depends on the community. Thankfully, there seems to be an active community that are still playing the game (despite it being a few years old) and there's always someone willing to help you learn the ropes. Recommended if you like party games that involve deduction and bluffing, especially if you have friends to play it with. Is the game worth $4.99 USD? : Yes, despite the game being not much more than a glorified chat client. The game thankfully still has a rather active community (hundreds of players online each night) and it's usually doesn't take long to start a Classic mode game.